...the central bank's estimated aggregate ETF balance totaled 29 trillion yen (about quarter trillion dollars), which is equivalent to nearly 5% of the market capitalization on the TSE's first section. Why does the BOJ continue to engage in such destructive, for price discovery and financial analysis, behavior? Well, the stated purpose behind this ongoing blatant intervention in capital markets, is that the BOJ was using ETF purchases to stoke inflation by spurring gains in asset values, as well as promoting active private consumption. Has the BOJ had any success in its narrowly-defined mission? The answer is a resounding no because aside from a brief period of sales-tax induced price increases, Japan's nationwide CPI is now the same as it was ten years ago, just barely above 0%, and has averaged 0.45% over the last 36 months. Worse, if the BOJ's desire is to "reanchor" inflation expectations higher, success has been just as elusive. 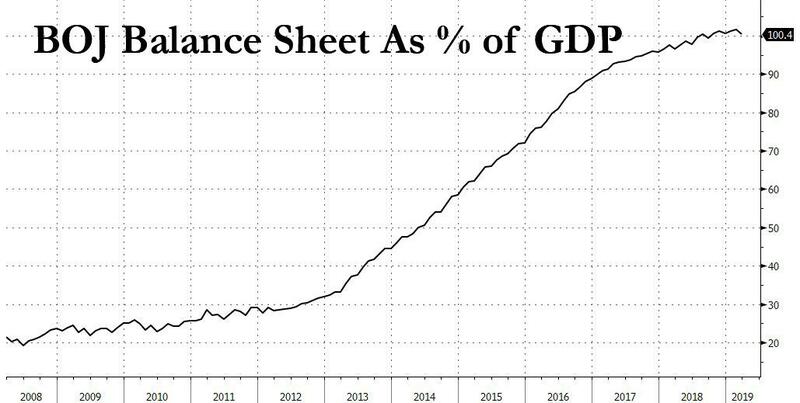 According to a Bloomberg survey of 2,127 Japanese households conducted in February and March, half of respondents "have never heard of" Kuroda’s grand monetary stimulus, “the highest level since the question was introduced in September 2013." Why do we bring up Japan's failed equity purchases as an to stimulate inflation and grow the economy? Because according to the top bond strategist at the world's largest asset manager, it's time for the ECB to do precisely what the BOJ is doing: according to Rick Rieder, BlackRock’s chief investment officer for global fixed-income, in its next attempt to stimulate the European economy, the European Central Bank should purchase stocks. While several trial balloons have dropped recently, according to which European policy makers are mulling a tiering system to mitigate some of the side effects that negative rates have on financial institutions (just like in Japan), bolder action is needed to spur capital investment and merger activity, said Rieder, who manages more than $60 billion across various funds, and the next big monetary experiment should be the ECB's purchases of European stocks (just like in Japan). According to Reuters, with rates sufficiently low to encourage the addition of leverage, and with more than $200 billion in European corporate debt trading with a negative yield, further steps in this direction would be "pushing on a string." Thus, stimulating via the equity channel is the least-worst option, Rieder said according to Bloomberg. “The cost of their debt in Europe is much lower, the cost of equity is too expensive,” Rieder told Bloomberg TV in an interview last Friday. "What I think the ECB is going to do is going to buy their equities. I’d rather see fiscal, but we’re not going to get that. So I’d hit the right part of the capital stack." Perhaps Rieders is right, and the ECB has no other options left: as such purchasing equities may well be the last ditch effort to preserve credibility before all faith in the ECB disappears. On the other hand, the ECB switching its purchases to a riskier part of the corporate capital structure could have unintended, if not devastating, consequences. "That would basically signal to me that, again, we are at the end of the world rather than things are getting better," said Krishna Memani, Oppenheimerfunds’ chief investment officer, who said such an announcement would push him to reduce European exposure. "I think it would be a very big mistake on the part of the ECB." And that's precisely why Mario Draghi, who initially trial ballooned this idea back in 2016, will do just that. (For an extensive take whether the ECB can, and will buy stocks, please read the the following analysis from ABN AMRO).